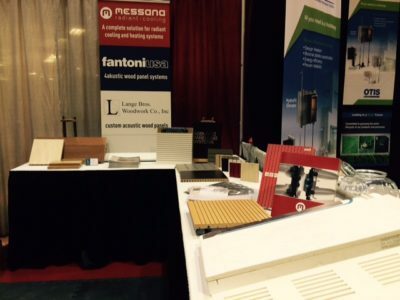 Messana Radiant Cooling had a great show at the 83rd annual AIA Wisconsin Convention & Building Products Expo in Madison WI. We were exposing our radiant cooling panels: Ray Magic and Ray Magic Quad (for commercial applications). At the show we participated with our partners Fantoni USA (4akoustic wood panel system / radiant panels) and Lange Bros Woodwork (custom woodwork projects). Thank you to all our visitors and a special thanks to Tom Tometz for representing Messana product at the AIA show. We look forward to participate again next year.